I officially became a Steelheart fan with Good 2B Alive but previous to that, I had heard and liked Tangled In Reins. Two years after hearing Good 2B Alive, I finally picked up the band’s debut. I’ve always been put off by the cover. It’s a a bit… prissy and misleading. You’d think maybe it was another female hard rock act like Vixen or something. I guess someone else thought so too because there was a reissue with a different cover released in 1991. Getting to the music, it’s the typical early ’90s slick hair metal sound that all the labels by this time were putting out but with one exception: Michael Matijevic. This guy is easily one of the most gifted (if not *the* most gifted) singers in the subgenre but also is a powerhouse in his own right compared with some of rock & metal’s legendary singers. If Steelheart were a HEAVY METAL band, Matijevic would be a legend. No doubt about it. 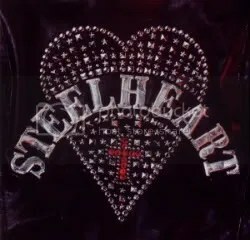 But because Steelheart came late to the pop-metal game and did not achieve the same success as they might’ve had if they came out earlier, Steelheart is remembered as nothing more than a second-tier (at best) hair band by most people. The music isn’t bad at all though, in fact, it’s really good. “Love Ain’t Easy” is a great rocker, “Can’t Stop Me Lovin’ You” is probably the album’s catchiest song, “I’ll Never Let You Go” puts the POWER in power ballad and then there’s the epic ballad “She’s Gone”. Those last three songs are Michael’s best vocal performances, I think, for this album. Without Michael, this album would still be very good but with him? I think this is one of pop-metal’s all-time best albums. Bruce Dickinson (yes, that Bruce Dickinson) is credited as the album’s executive producer. Pretty cool! I’ve always been aware of SteelHeart, but up until last year, outside of “Love Ain’t Easy”, I’ll Never Let You Go” and “Can’t Stop Me Lovin’ You”, I wasn’t too familiar with them. I was missing out on a lot! I was able to track down their first two albums, SteelHeart and Tangled In Reins, and both albums are very good melodic hard rock with that late 80s sound (though they both were released in the early 90s). “Michael” Matijevic (he has since returned to his original first name of Miljenko) was one of the most powerful voices to come from the “hair” scene. His voice is just as strong today. 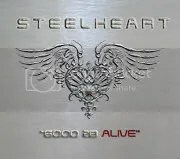 SteelHeart rebounded in 2006 with the excellent Just A Taste EP (featuring Tracks 2, 3, 4, plus “We All Die Young” from 1996’s Wait) and in 2008, their full-fledged studio album, Good 2B Alive shows Miljenko is back with a vengeance. Those who are maybe expecting a nostalgia release full of late 80s hard rock won’t find it here. Miljenko has worked long and hard on delivering a great modern melodic hard rock album. I remember first hearing “LOL” on XM Radio’s Boneyard channel earlier this year and it blew me away. Why this song wasn’t all over mainstream rock radio, I don’t know. “Shine a Light for Me” and “Good 2B Alive” are definitely single worthy as well. Even my fiancee is enjoying these songs (especially “LOL”) and we have totally different tastes when it comes to rock (she’s into the newer, blander bands more than I am). As mentioned earlier, Miljenko’s voice is still in fine form and he can hit those high notes whenever he wants, but he doesn’t spend the who album doing that. There are two versions of “Good 2B Alive”. Track 9 is a full-on hard rock song with some orchestral arrangements and the Track 10 version (simply titled “G2BA” on my copy) is a more soulful, acoustic take featuring a choir. Both tracks are very cool, and sometimes when a band includes two versions of one song, it feels cheap and lazy, but the takes on them are so different, I appreciate the inclusion of both. If I’m not mistaken, I believe this album was originally going to be called Samurai. FUN FACT: This album was recorded in Charlottesville, Virginia, the home of SteelHeart Studios. I just think this is really cool seeing as how that’s just a little over an hour away from my birth city of Lynchburg. =) Hey, we’ve got Dave Grohl from Foo Fighters and now we have Miljenko Matijevic! Highlights: All of it. Seriously, one of 2008’s best albums.